Steam boilers not used for power generation and of smaller size and energy output are termed packaged boilers. The heat source is usually either electric coils or a burning fuel. When a flame is used to heat the water it is known as a fired packaged boiler. Fired boilers are considered efficient steam generators with about 85% of the available energy converted to steam. They can be of water-tube or fire-tube design. Boilers incorporate many key aspects of heat transfer to create steam from water. This article describes how fired boilers work and their key components. A fired boiler consists of a burning flame enclosed in a chamber around which water is circulated until the water boils off as steam. Figure No. 1 shows a simple schematic drawing of a two-pass boiler and its primary components. Figure No. 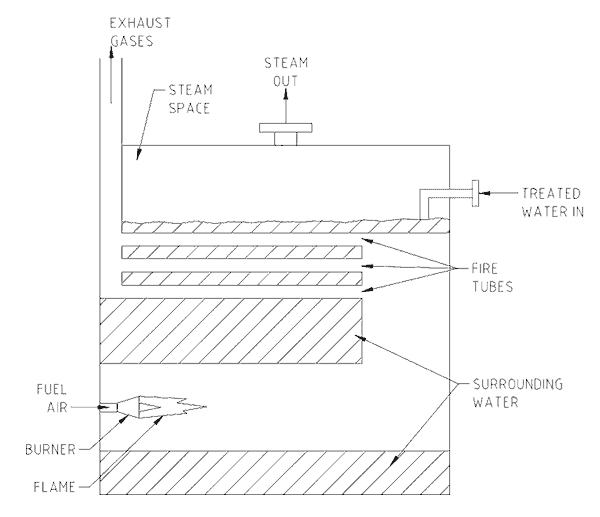 1 Fired boiler schematic drawing. Burners use gas, atomised oil mist or finely ground coal burnt in a stream of air to create a heat source. The water absorbs heat by circulating the water through pipes passing through the hot space (water-tube boiler) or by passing the hot gases through pipes passing through the water volume (fire-tube boiler). A boiler is a heat exchanger with hot gas on one side and cold water on the other. The metal tubes are held at each end by expanding them into holes drilled in thick sheets of steel. The method of expanding the tubes produce firm, leak-tight seals in the end tube sheets. Tube leaks can occur if the required thermal expansion of the tubes and the tube sheet is prevented because of scale build-up behind the tube sheets. The hot gases are made to give up as much heat as possible by passing them by the water several times. Eventually the temperature difference between the cooling gas and the heated water become to small to make heat transfer worthwhile and the gas is sent up the stack. The water inside a packaged boiler is bubbling as if it were a boiling saucepan on a stove. The water space is pressurised to the working pressure of the boiler. The higher the pressure, the hotter the steam. The pressure a boiler reaches and the volume of steam created depends on the temperature of the flame, the amount of surface area through which the heat enters into the water and the rate at which the steam is drawn from the boiler. If the steam pressure gets too high it is vented-off into the atmosphere by pressure relief valves. When bringing boilers up to working duty it is critical that they are warmed gradually to allow to metal to expand gently without thermal shock. Follow the manufacturer’s instructions exactly in this regard. Boilers that are brought up to temperature too quickly, too often, will give years of expensive metal fatigue, refractory and thermal stress problems. The water to a boiler must be treated to remove ‘hardness’. ‘Hardness’ is the scale that builds up on hot surfaces when water is boiled. If the ‘hardness’ is not removed it scales over the pipes and stops heat transfer from the hot flame to the water. This means expensive energy is wasted. ‘Hardness’ deposits are often seen in kitchen kettles used for boiling water as white or brown solid sediment. ‘Hardness’ causing chemicals do not go out with the steam. As the water that carries them boils away, they stay behind in the boiler. 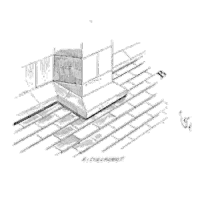 If they are not mostly removed before entering the boiler they would soon build-up within the boiler as solid material covering pipes and stopping heat exchange. ‘Hardness’ is removed by passing the incoming water through ‘water softening’ or ‘demineralisation’ plants. Water softening removes the scale forming ‘harness’ compounds, while demineralisation removes the same compounds plus other chemicals that can cause problems in high temperature boilers. The water quality is measured by counting the amount of dissolved chemicals in the water. The count is known as the TDS (Total Dissolved Solids) of the water and is measured by placing a conductivity probe in the water and reading-off the value. The treated water is put into a feed water tank which acts as a buffer storage incase of water supply outages. It also provides a constant pressurised water supply to the boiler feed water pumps. The pumps draw water from the feed water tank and feed it to the pressurised water supply of the boiler. It is best to preheat the feed water. In some boilers the hot gas going out the stack is put through an air pre-heater to heat the incoming air and get as much energy out of the fuel as possible. Be sure that the gas is not cooled below its dew point and water condenses on the cold surfaces. The sulphur compounds in the burnt gas create weak sulphuric acid and corrode metal. This happens when a boiler is started from cold. Moisture will form on the metal surfaces until the metal throughout the fireside is above dew point temperature. Heat can also be recovered from the boiler blow down. The blow down is used to remove dissolved and undissolved solids that build-up over time in the boiler when it is used. The blow down water can be put through a heat exchanger to warm the incoming feed water and then sent for treatment to neutralise the highly alkaline chemical content (pH 10+) back to pH 6 – 8 before discharging it in a contained evaporation pond. scavenge oxygen within the steam space and distribution piping to stop pipes rusting away. Air will be drawn into the steam-side whenever the boiler is depressurised or repairs are done on pipe work. convert dissolved and undissolved solids into other chemicals that cause no harm to the boiler surfaces. reduce foaming and associated water mist carry-over into the steam distribution piping. The chemicals are metered into the boiler feed water at slow rates with small dosing pumps (See article Metering & Dosing Pump Operation). A boiler will perform well and trouble-free within a small range of ideal conditions. To insure it remains within the right range it is important to regularly test the water quality in the boiler. A chemical test kit, a pH meter and a conductivity meter are required to check the water condition. The boiler chemical supplier can advise and train boiler operators to do the tests. Tests and adjustments to the treated water quality, blow down amount and chemical additions to keep the boiler’s water within its required quality ought to be done each shift. Getting honest, reliable and trustworthy results from these tests are critical and a top-quality boiler plant operator will be extremely careful and diligent in this duty.